We recommend replacing the sediment filter, carbon filter, and the Mineral Alkaline filter once a year for average use. If you are using a high volume of water or your water contains a lot of sediment you may need to replace filters more often. If you notice the flow of water decreasing or water not tasting as good as it used to then is probably time to replace your filters. 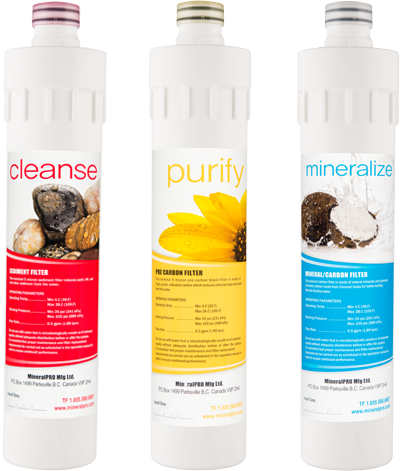 Replacements for RO System filters in one simple kit. 1 x 5 Micron Carbon pre-filter. These Filters only fit our #700 Series Systems. For customers with original 100 Series RO Systems that would like to update to our new #700 series, Mineral Pro will replace the RO original # 100 Head Assembly to our new #700 Series Head assembly for free with the purchase of a new set of #700 filters. So you get all the benefits of our new systems and a new system at no extra cost! The 700 Head Assemblies come pre-assembled with tubes attached and fittings required making for an easy changeover! Cost is $250.00 and includes free shipping! 3 lbs. or 1.36 kg.